Can the people of Illinois explain this to the rest of us? Yesterday, Rod Blagoyevich played the race card to hide his own (alleged) wrongdoing and corruption and gain voter sympathy and support. We suppose. And he used a respected African American member of the U.S. House of Representatives and another respected Illinois politician to do it. After announcing that he had appointed Roland Burris as his nominee to fill Barack Obama’s seat in the U.S. Senate, Rod Blagoyevich urged the participation of Democratic U.S. Rep. Bobby Rush of Chicago. “Let me just remind you that there is presently no African-American in the Senate,” said Rush. Excuse me? How is that relevant? And where did you come from? At that point the news conference seemed to be taking a turn like that found in a banana republic or in a carnival. Congressman Rush, appearing at Blagojevich’s announcement at Burris’ invitation (we were told), emphasized the role of race in the appointment and seemed to use racially charged terms to defend the appointment to the Senate. Rush also said if the Senate rejected the Burris nomination he would take the issue to the Congressional Black Caucus…. Blago is using us all. And he is using the black community the most, it seems…. Didn’t Groucho Marx say, “I would never join a club that would have me as a member”? Illinois Gov. Rod Blagojevich shakes hands with Pastor Marshall Hatch of the New Mt. Pilgrim Missionary Baptist Church as he arrives at his home with Pastor Ira Acree, right, of the Greater St. John Bible Church, and the Rev. Steve Jones, president of the Baptist pastor’s conference, Friday, Dec. 12, 2008, in Chicago. 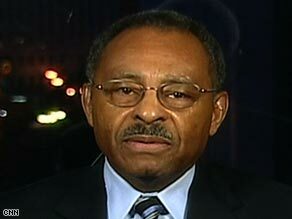 I was sad to see Roland Burris diminish his political legacy by going along with Rod Blagojevich’s charade, and sadder still to see Rep. Bobby Rush bring race into the scandal. Illinois has the proud distinction of electing two African-Americans to the Senate, as well as giving America its first black president. I’d love to see a black candidate fill Obama’s shoes as well. But Rush and Burris don’t advance the cause of black political progress, or social justice, by claiming race should in any way legitimize this illegitimate choice by Blagojevich. 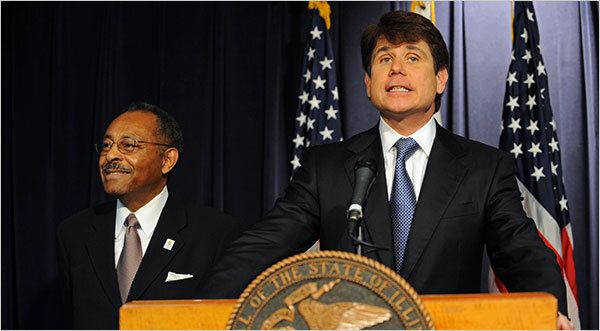 Thankfully, Barack Obama quickly added his voice to those objecting to Blagojevich’s slick move. You are currently browsing the archives for the Groucho Marx category.